Computers are a great basis to promote a more “green” environment. Worthington Direct has a great selection of Greenguard certified furniture which would be the perfect base for technology of all kinds. Visit www.worthingtondirect.com today and browse through the product catagory called Greenguard Certified Furniture. 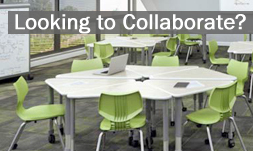 Products include; classroom tables, classroom desks, classroom chairs, computer tables and booktrucks. SAN FRANCISCO, Oct. 18, 2007 – Dell issued a global challenge to members of the “ReGeneration” – people of all ages who share a goal of protecting the Earth – to help its engineers design the world’s most environmentally responsible computing technology. The competition, which is endorsed by the Industrial Designers Society of America, is designed to invigorate the academic and industry dialogue regarding designs for environmentally responsible computing. The professionally juried competition is open to all, with a focus on students of universities and colleges that offer design programs. Competition details are now available and the submission period spans January through April 2008. Jury-selected finalists will be announced in May 2008, and honored with a prize of $10,000 each. A popular vote will be held online to find the finalist submission that most resonates with the public. That winner will receive an additional $15,000 prize. If the popular vote winner is a student, his or her university is eligible for a matching $15,000 prize.